Does the word weaning strike fear into your heart, or bring back memories of anxiety, stress and general chaos at mealtimes? Before we started weaning (my little one is 8 months), I thought…how am I ever going to switch her onto solids, like where on earth do I begin? We were going to do it our way, that suited “A”. ….You wouldn’t go on to eat a whole dinner plateful of food would you? So don’t make your little one eat something they don’t like. If “A” takes a mouthful and doesn’t like it, I try one more, and if the reaction isn’t a good one (normally a screwed up face or she flinches and waves her arms about, yes we like a bit of dramatics in our house), then I don’t make her eat it. We try something else, or we switch to something I know she likes. By making sure she enjoys it, it encourages her to give it a go, as she knows I won’t make her eat it. Good doesn’t have to mean super expensive though, just a chair that suits your needs! Where you are likely to feed your little one? We got a highchair that can be put high, or as low as the floor. The seat can also be tilted back, which is really handy when she was learning to hold her own cup herself, and needed help tipping it up as the angle did it for her enabling her to drink it all by herself! Feed your little one where ever suits you. I got a speech from my health visitor about how I should only ever feed “A” in the kitchen at the table never anywhere else! Well, that’s just dandy, but what if you are out at someone else’s house and they eat in the living room or you are out and about and she needs to eat in the pram? We use the highchair in the kitchen mostly at the table, but we have a sofa in kitchen too and I pop her chair down to lowest setting and feed her from the sofa sometimes too. We have had breakfast in the baby walker too, snacks in the supermarket in the pram and bottles in the car seat during long journeys, and you know what that’s okay because it suits us! Do what suits you as a family :) . 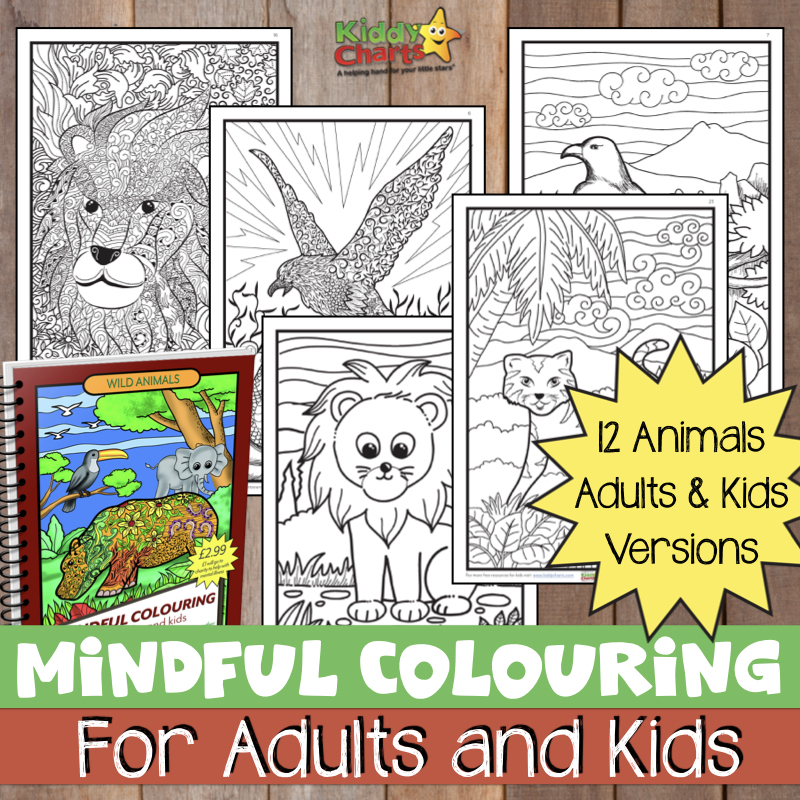 This really helped me, by being organised at mealtimes, especially those first few or when you are moving between stages; things are less stressful and more easy going for both of us. I try to make “A’s” food from scratch, but I’m not going to stress if we use a pouch of bought food. We have a little shelf just for pouches, pots and general nice bits and bobs which we use alongside home made food. 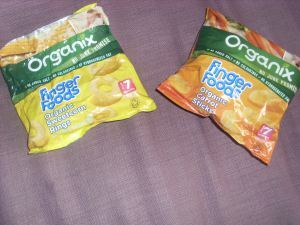 Also means if we are in a rush or need to go out, we simply pop a ready made pouch into the changing bag and off we go. Don’t let anyone make you feel guilty about giving your little one shop bought foods, if that’s what you want to do. 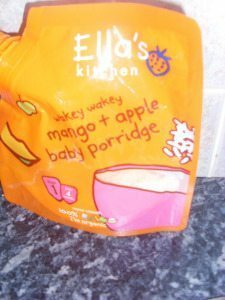 We use Ella’s kitchen brand as it 100% organic and only has natural ingredients no additives. I know some people who feed their baby use the same things day in and day out, fair enough, but I wouldn’t fancy eating the same thing all the time…would you? Variety the spice of life and all that, so we mix it up a little! I like to put a little bit of a number of things out for her to try. 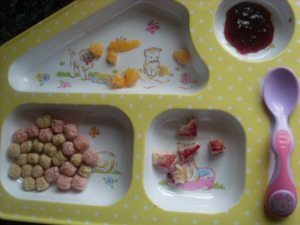 We use a plate with lots of different compartments on it from Cath Kidson, and its great, as it gives her something to look at and each little area has a new treat in it for her. Try different textures and tastes such as a slice of banana, a few pieces of pancake and a little jammy or puree dip. Keeps them interested and engaged in what their eating. Once you are over the puree stage, and onto more solid food, don’t be afraid to let your little one try bits and pieces of your food. I don’t mean give them a sweet chilli crisp or a sip of a fizzy drink :), but things like different veg, meats, fruits etc. “A” tries everything she’s had a taste of mild chicken curry, little licks of ice cream (yes I know its sweet, no I do not feed my child ice cream or sweet stuff regularly don’t worry ;) ). She has also had pineapple, strawberries, blackberries, sweet potato, fish …. you name it she’ll try it, she may not like it but she’ll try it. Remember you are the biggest influence over your little one, and by watching you eating it, it will naturally encourage them to want to try new foods too :) . After I got over the anxiety of giving her things to put into her mouth herself and relaxed, we really enjoyed giving her finger food. I could see that she was perfectly capable of lifting the food up herself, crunching it and swallowing it without choking. It was really cute to see her hold a bit of grape or a slice of banana and pop it into her mouth herself. It is also nice to watch her study her plate or bowl and choose what to eat next. It helps develop their motor skills; learning to pick up little bits and pieces. I often pop a few things such as the Organix sweetcorn rings, or carrot sticks on her highchair tray along with a few small slices of banana or some grape or apple cubes. This also means you are free to do any bits and pieces in the kitchen too, such as tackle the dishes :). Always supervise your little one though, safety first and all that! 7. Baby versions of big person meals! There’s no point in giving yourself double the work if you want to cook from scratch for your little one. So why no cook the same or similar to what you are having yourself. We had some lovely bibs and they have been destroyed by lovely tomato’s, strawberries etc stains, so get some bibs that you don’t mind becoming a little rough around the edges. You can use your nice bibs out and about, no ones going to see your bibs at home ;). I bought a large multi-pack of bibs from a supermarket for next to nothing; they spend most of their life in the washing machine or on the line so it doesn’t matter to me or “A” for that matter if they aren’t pretty! For your bowls and plates, try to make sure that you have a few handy. Sometimes, we can be unexpectedly caught off guard with a little right handed karate chop, and the bowl and its contents land on the floor and you need a new bowl and new food fast. This means that it is a good idea to have spares. A messy mat is a very good investment, you can pick them up for as little as £2.00 in most supermarkets (kids craft aisle), and you can simply place under highchair – perfect to catch spills and wipe up in no time! I choose nice colourful spoons as well, I think that it keeps “A”‘s attention, especially when she was tiny. She used to focus more on the spoon because of the colours and got the hang of eating off a spoon quite quickly. Some mums hate the idea of messy eating, and are sat, with baby wipes in hand, for even the tiniest dribble that may run down their little ones face. I have taken the view, be it right or wrong, that she should be allowed to stick her hands into the food if she wants, how else is she going to learn how to use her hands to eat? We’ve had bowls on heads, food all over clothes, highchair, her and me, but she’s had a big smile on her face and has a full tummy so it’s all good by me. Don’t get me wrong, dinnertime is not chaos here; not even slightly. “A” sits most of the time happily, while I feed her from a spoon, or she lifts the finger food herself. We don’t have to hold her hands out of the way and we have not had a dinner time tantrum just yet (touch wood). I think this is because she’s free to eat and explore how she wants and doesn’t feel restricted. 10. Do it your way…. Do mealtimes the way that you feel is best for you and your little one. What works for me, may not work for the next person and vice versa and that’s 100% okay. Are you weaning your baby? Do you have any tips that you would like to share with us? We would love to hear from you. I'm Vicki. I am 24, a wife and a stay at home mummy to a gorgeous little girl. I run my own little craft business from home mainly selling handmade baby bibs and bobs under the name EllieBearBabi; selling on etsy.com/uk/shop/elliebearbabi. I also blog about bits n pieces like parenting crafts, reviews and what we get up to in our lovely little life. Thank you for your helping post i Am gonna try the tricks.